Whether you gravitate towards a modern exterior style or one that’s more rooted in the past, concrete is an excellent material choice. Because concrete is so versatile it can be used for paving, outdoor counters, fire pits and even patio furniture. When it comes to color and texture choices, the options abound. 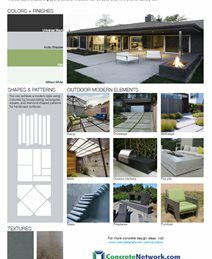 Use the style palettes below as guides to discovering how concrete can be used outdoors to achieve a specific look. Large geometrical patterns, industrial materials and sleek lines are the trademarks of modern design. Concrete, with its smooth finishes, subtle shades of gray and utilitarian character can be used to achieve a contemporary look. Distressed finishes, stone surfaces and warm, masculine colors evoke the Old World style. 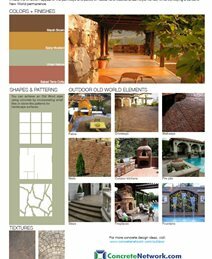 Concrete gives you the ability to imitate the timeworn appeal of the pathways and patios of Tuscan and Mediterranean-style homes, while conveying a sense of New World permanence. 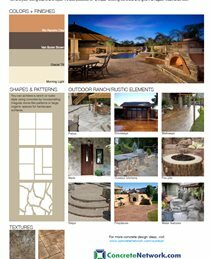 Concrete in rich earth-tone colors and rough stonelike textures contributes to the rustic charm of ranch, farmhouse and country home styles. Using stains and dyes, it’s also possible to “antique” existing concrete and give it an aged, weathered look. Formal brick-lined and stone pathways often grace the exteriors of traditional homes. This same classic, unfussy style can be replicated in concrete by incorporating formal details such as scalloped edges, brick-patterned borders and symmetrical lines. Concrete is a natural fit for the beachy sand-and-sea vibe of an oceanside home. 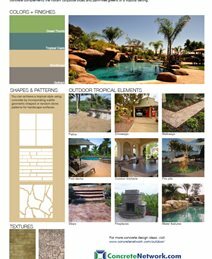 Colored in natural browns and sandy hues, concrete complements the vibrant turquoise blues and palm-tree greens of a tropical setting. 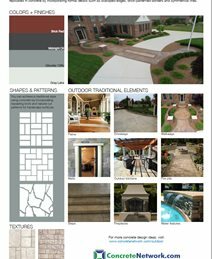 Concrete is an excellent option for patios, pool decks, paths and driveways. Shape color and texture can all be manipulated to support the style you would like to achieve. For example, if you want a modern look, the edges of your patio can be formed with straight lines and hard corners. You would also select a gray color and opt for a texture-less finish or subtly exposed aggregate. On the other hand, if you want a rustic driveway, it would have sweeping curved edges, an earthy color and a stone texture stamped onto the surface. Outdoor countertops can also be made with concrete. Again, the choices you make should support the overall style of your backyard. A countertop textured to look like wood would be perfect for a rustic setting, while one polished to expose the aggregates and mimic granite would work well in a traditional outdoor space. With concrete countertops a custom product can be created that will suit any style you can imagine. Concrete can also be used to create fire pits, fireplaces and water features. Remember to keep a strong design theme throughout your yard by using similar colors, shapes and textures. Concrete is an excellent choice for outdoors because it is durable, easy to maintain and can be adapted to a variety of styles.